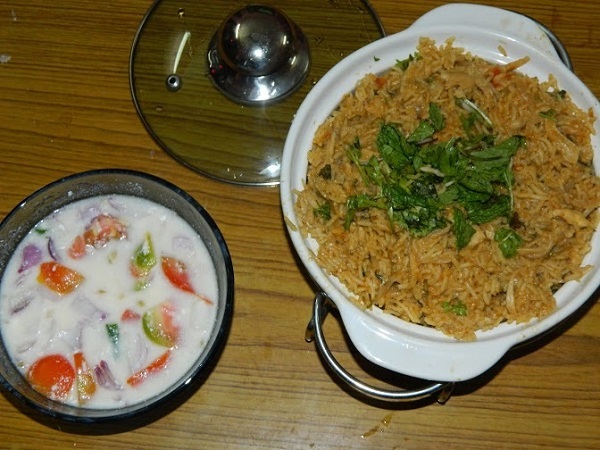 Today’s recipe is a nice tasty biryani which can be prepared easily and can be served to your family, for guests or even packed for lunch. 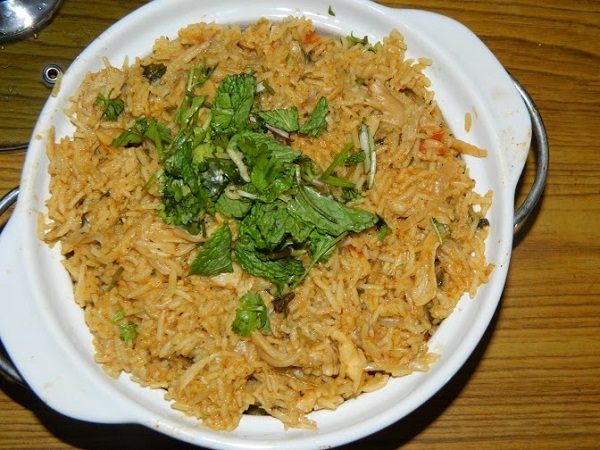 The difficult part in making this biryani is cleaning mushrooms and the easiest part is this can be cooked in a pressure cooker. 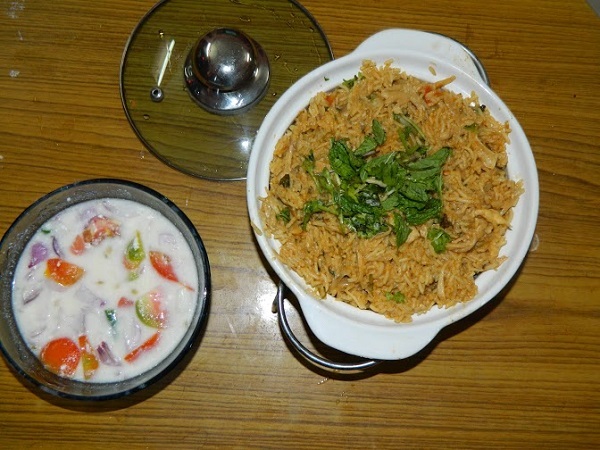 This recipe makes use of biryani masala, you can make use of homemade biryani masala powder or store bought ones. This can be served with cucumber raita or any onion tomato raita, as yogurt tones down the spiciness and balances the heat of biryani. 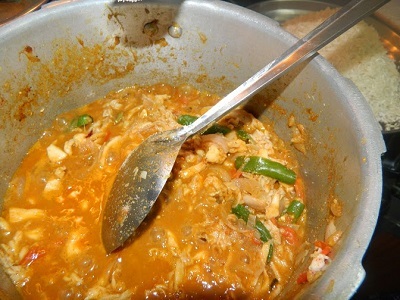 This can also be served with plain curd. Mushrooms are said to be a nutrition powerhouse, have high anti-oxidants, many other nutrients and is believed to improve immunity. 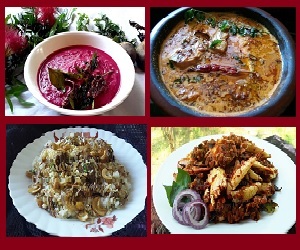 There are numerous dishes prepared with mushrooms like mushroom pepper fry, in curry, pulao, masala, manchurian and so on. Now to the recipe..
1. 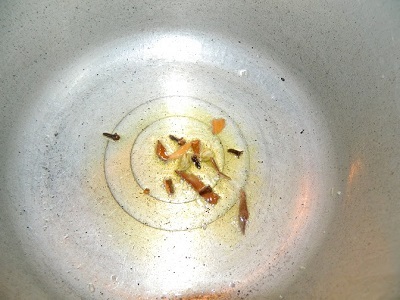 Wash and soak rice for 15 – 20 minutes. 2. 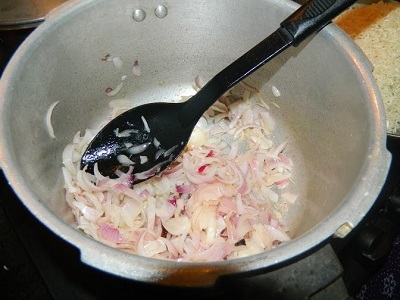 Slice onion lengthwise, keep aside. 3. Clean mushrooms and cut into pieces. 1. 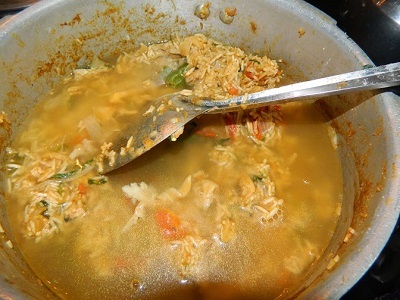 In a pan, heat butter, saute the drained rice, keep it aside. 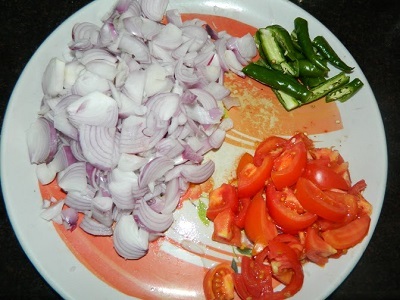 Chop onion, green chillies and tomatoes and keep aside. 2. 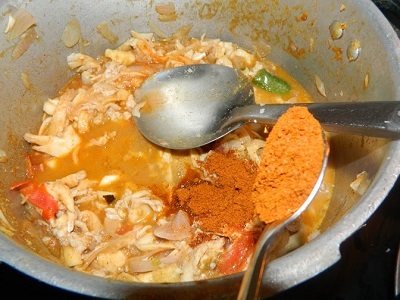 In a pressure cooker, heat 1 tablespoon ghee + 1 tablespoon oil, When hot enough, add cinnamon, cloves and cardamom and saute well. 3. 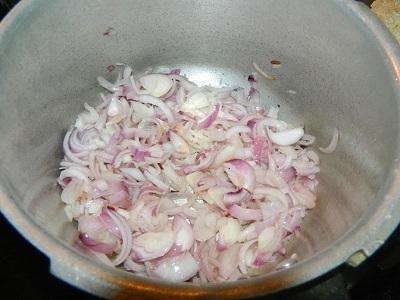 Next add sliced onions, and saute till brown. 4. 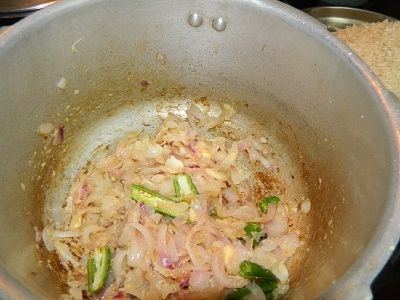 Add slit green chillies, ginger garlic paste and saute well till the raw smell goes off. 5. 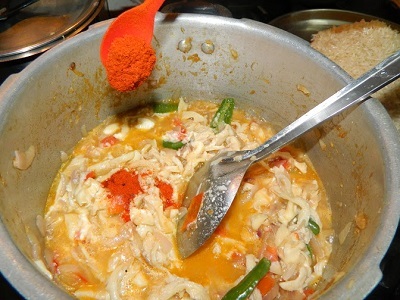 Next add chopped tomatoes and saute till they turn mushy. 6. Now add mushrooms, saute well. 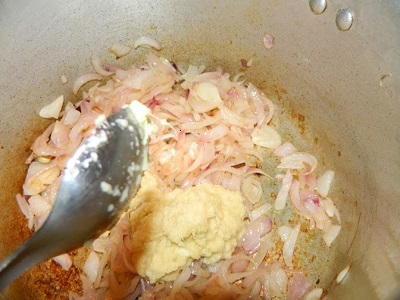 Then add curd and mix well. 7. 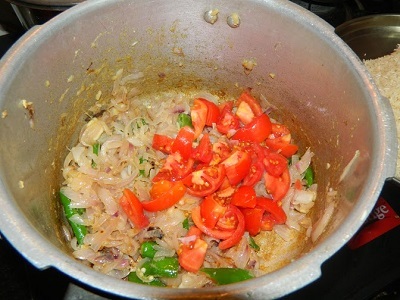 Then add chilly powder, coriander powder, biryani masala and salt, saute for 4 minutes. 8. 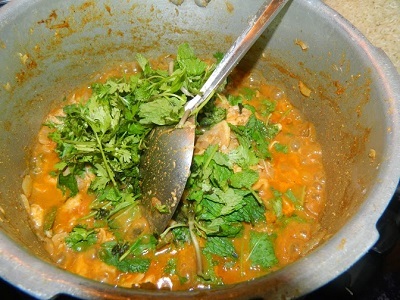 Now add finely chopped mint leaves and coriander leaves and saute again for 2 more minutes. 9. 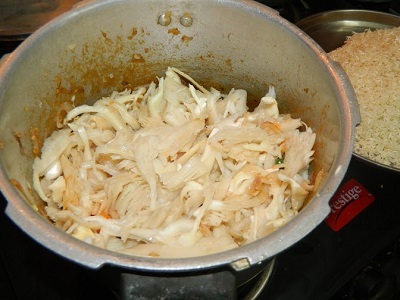 Now add already sauteed rice, 1 1/2 cups of water, lemon juice, mix well. Check for salt. 10. Pressure cook for 2 whistles, or for 10 minutes in low flame. Turn off the flame. 11. Wait for pressure to subside. 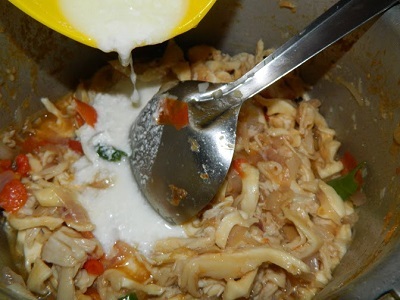 Open the cooker, fluff the rice with a fork. 12. 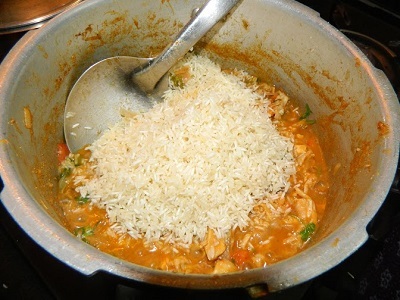 Yummy biryani is ready to be served. Serve with raita.